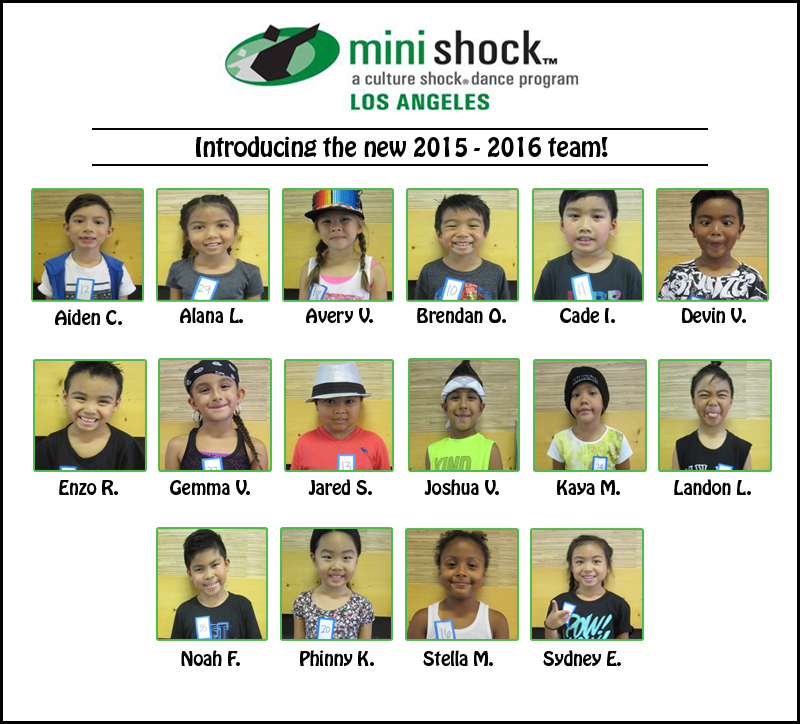 Congratulations Mini Shock LA 2015-2016! HomeCongratulations Mini Shock LA 2015-2016! Thank you to everyone who came out to audition for Mini Shock Los Angeles. There was a lot of great talent and energy on the dance floor, which made it for a very difficult decision in selecting our team. For those who do not make the team this season, please do not be discouraged. We feel that you may just need some more time to train and take class. We will be offering our Kids Hip Hop Class Program (for different age groups and dance levels) starting in October and if you would like to receive more information on our classes, please contact us at minishockla@gmail.com. Whether you make the team or not, we are all so incredibly proud of each and every dancer who had courage to come out to audition, try their best, and dance their hearts out! 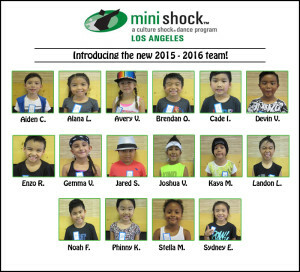 With that said, we proudly present the Mini Shock Los Angeles 2015-2016 dance company! Congratulations and welcome to the family! Mandatory parent & dancer orientation for the new team will be held Sunday, August 2nd at 12:30pm. You will receive an email with more information.